Rob Ford, as we all know, has been known to smoke some crack cocaine. But that's faaaar from the only problem with his time in office. Even if he were stone cold sober, he would still be a terrible TERRIBLE mayor. He is a man pretty much completely untethered from reality. He makes wildly false claims about even the most basic aspects of his job. He invents make-believe statistics. He spreads misinformation at a breathtaking pace. In one 16-minute speech, Torontoist counted more than 50 "lies, half-truths, and instances of disingenuous spin." That's an average of more than 3 every minute. And yet the people he allows to interview him have pretty much entirely let him off the hook. While they get caught up on the drug use, they miss the other issues, allowing Ford to repeat his false claims about his policies and "achievements". And it's not just the Jimmy Kimmel types. Even Peter Mansbridge, one of the most respected broadcasters in Canada, totally dropped the ball. Many Torontonians have been anxiously looking forward to the day when Ford would have to answer questions from someone who knew the relevant information and wouldn't let the Mayor off the hook with lazy lies and misleading "facts". And finally — finally! — it happened this morning on CBC Radio. 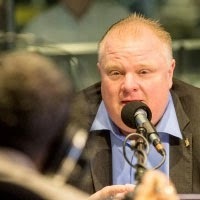 Metro Morning's Matt Galloway had the Mayor in his studio for a 15 minute interview. And while Ford still manages to sneak through a few false facts, it is, hands down, the best interview of Ford we've seen since he took office. You can watch it on the CBC's website here.